Edinburgh and everywhere else in the UK has been basking in some glorious weather recently, which after our winter seems only fair to me, so we've been out making the most of it whilst it's here. With the weather staying good for the weekends too we recently went for a walk along the Union canal. 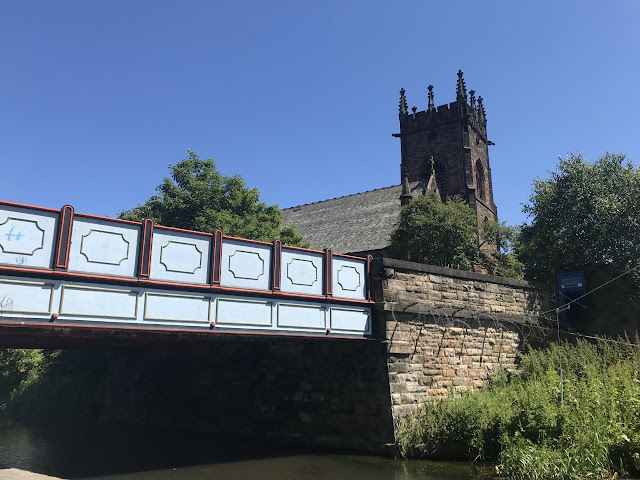 As I've mentioned several times in blog posts we have a great little book full of walks around the city as well as further afield and this was another one inspired by one of those. 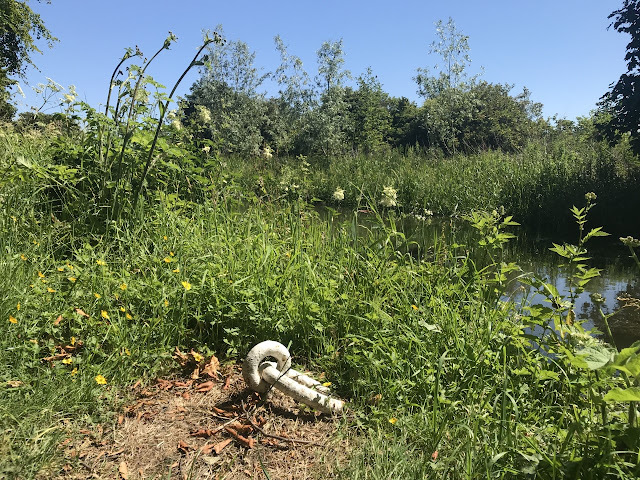 From the city centre we took a bus to Lanark Road specifically the Kingsknowe area where it's then easy to join a footpath that runs right beside the Union canal. 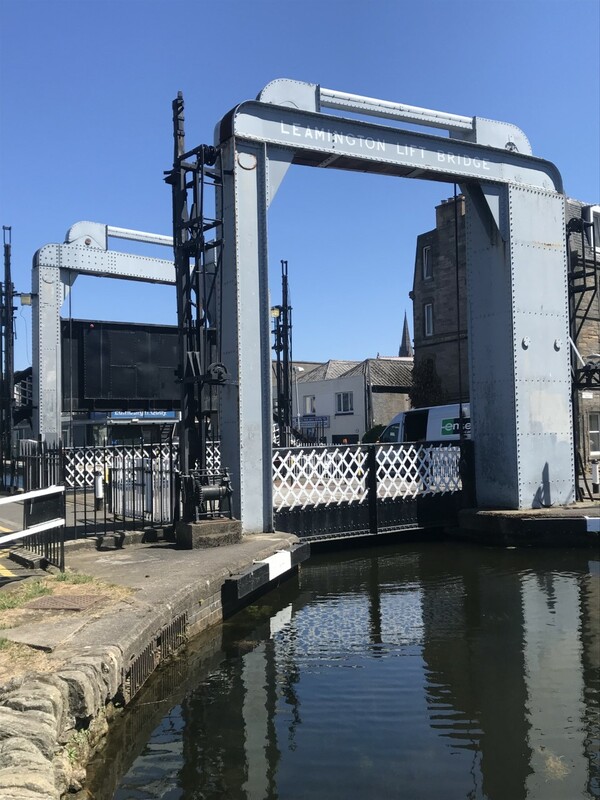 The canal, opened in 1822, runs from Falkirk to Edinburgh and was built originally to bring materials, particularly coal, to the capital. To make this a quicker process it was designed without locks as a contour canal. It also follows a course at a constant 73 metres above sea level, earning it the nickname 'the mathematical river'. Although it was successful initially with the coming of the railways it's use for the transportation of goods lessened. It was eventually closed to commercial traffic but saw a revival when it was reopened to pleasure traffic, thanks to the Millennium Link a project to reconnect it to the Forth and Clyde canal via the Falkirk Wheel, a rotating boatlift. Something we actually went to visit a while ago but unfortunately we managed to choose one of those times when it wasn't operating! Once we were on the towpath we were soon after crossing the Slateford Aqueduct which carries the canal over the Water of Leith, you should be familiar with that stretch of water if you are a regular reader of my blog. The pathway alongside it at this point is quite narrow and I'd advise you to keep well into the side when you're crossing it. Next you cross the Prince Charlie Aqueduct, all the while getting views beyond the outskirts of Edinburgh to both Craiglockhart hill, Corstorphine hill and the Pentlands beyond that. 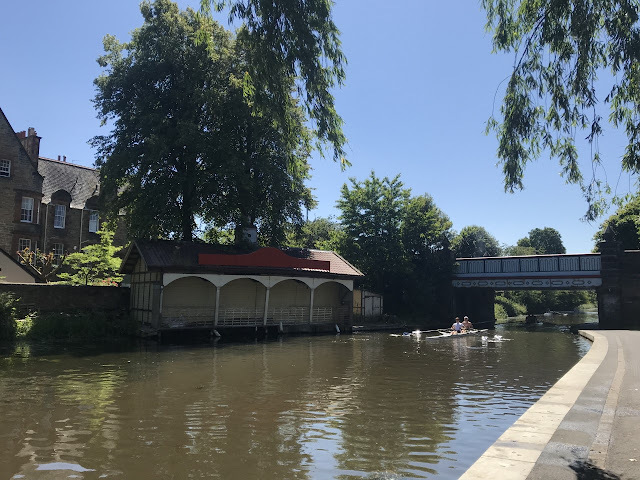 As I mentioned before the canal is now used solely for leisure purposes, one of the main uses in this area is by several local rowing and canoeing clubs from both the universities and schools. With it being such a beautiful day on our visit we saw plenty of rowers out getting some practice in as well as some inevitable BBQ's being fired up at their respective boathouses. 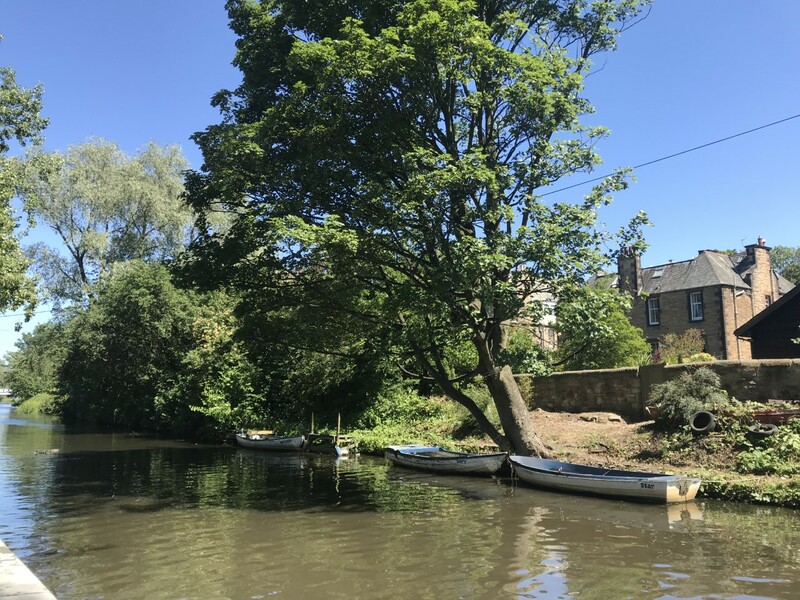 The Edinburgh Canal Society is one of several societies that promotes general use of the canal and was formed originally to lead the campaign for the reopening of the Union canal with one of their first projects being the refurbishment of the lovely little boathouse in the photo below. This served as their headquarters and as a base for hiring out boats. I'm not sure if they still do though as the boathouse looked a little rundown compared to some photos I've seen online of it. Anybody know? From here the canal passes underneath several brightly coloured bridges which you can see in a couple of my photos. 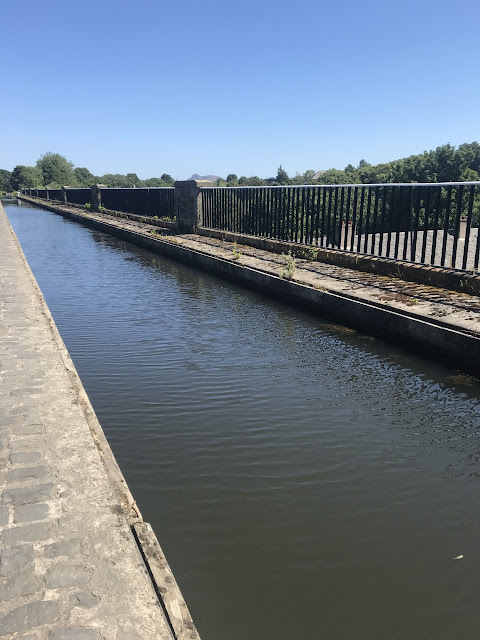 This part of the canal is also quite open with some parks and open spaces to the left (just out of shot), with it being such a beautiful day when we visited you can no doubt imagine just how busy these all were. Beyond this area the canal becomes more enclosed again with a wall and buildings rising up on either side which eventually brings you out into a more open space once more and then to the Leamington Lift bridge. The Leamington Lift bridge, a bridge that has a movable span which rises vertically to let boats pass underneath it, is near the Union canal's terminus at Lochrin Basin right in the heart of the city. It was originally installed around 1906 in a slightly different location to its current one. 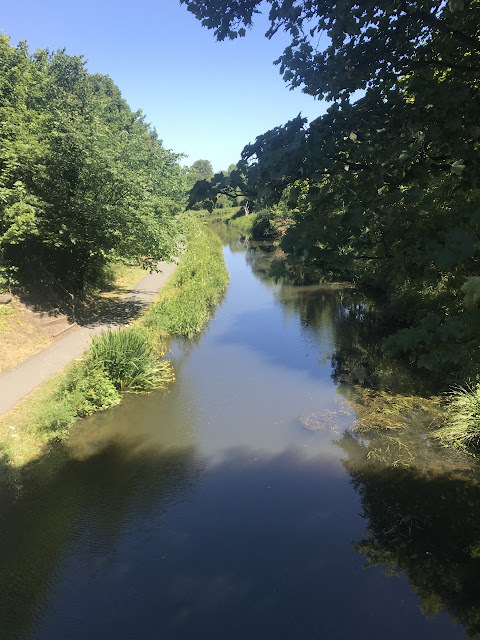 When the canal was shortened in 1922 to form the terminus at Lochrin Basin it was then moved to its current spot. Just like the Union canal though it eventually fell into disuse but as part of the Millennium Link project it was restored to allow boats to pass through it once more. Beyond the lift bridge you arrive at the end of the canal and in to the Edinburgh Quay a large development of apartments, offices, restaurants and bars etc. and something I had no clue existed until we arrived there! I also had no idea that when you leave the complex just a short walk along Fountainbridge would bring us on to Lothian Road, right slap bang in the city centre! I'm not sure how this area escaped my attention until now if I'm honest or that I had no clue that the canal runs right into the city in this way but I guess that's part of the fun of exploring this city that despite that I've now lived here for close to two years I'm still finding out more and more about it all the time! We didn't stop at any of the restaurants and bars on that day, as you can imagine with the sun shining in Scotland everyone was outside making the most of it but it's certainly somewhere we need to return to again at some point. One final thing that caught our eye as our walk finished was this preserved archway from what was obviously at some point Edinburgh's meat market. This wasn't actually mentioned in our walk book but a little digging later confirmed it was indeed the real deal and was a legacy of that very market. The meat market opened in 1884 following on from the opening of the city's first municipal slaughterhouse. 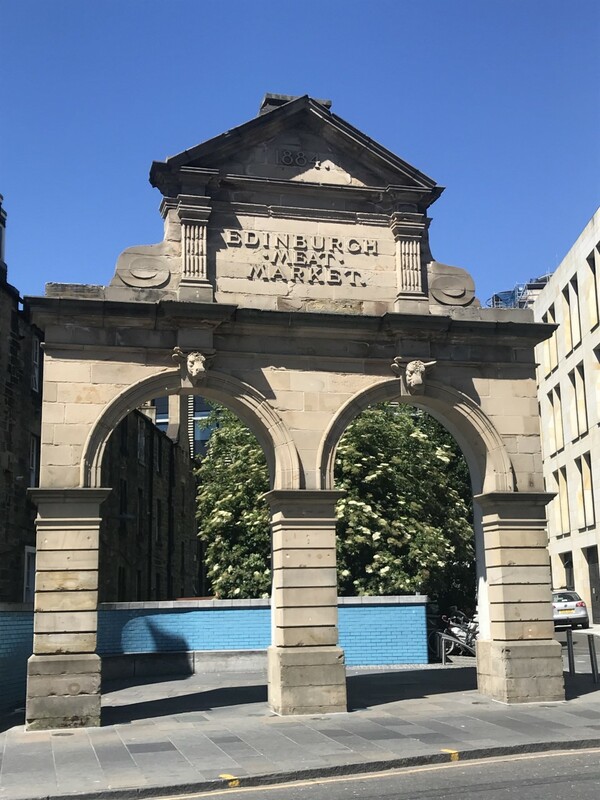 As the 20th century arrived and Edinburgh developed the slaughterhouse was relocated further out of the city and the meat market eventually relocated too in the 1920s. The original building survived until 2007 when it made way for a new office development but it's nice to see that at least one little part of it, with those very handsome bull's heads looking down on everyone, was preserved.